Remove anger, regret, resentment, guilt, blame, and worry. It is that time of the year where many people make healthy resolutions (and perhaps have already abandoned them). If you are like me you believe, no matter how difficult it is, that it is important to make time for ourselves. For example, since my schedule has been extremely busy it feels sacred to me to enjoy a quiet house. For the new year I wanted to make time to write and be more reflective on my personal and professional life. Of course, it’s the end of January and I have not carved out the writing time that I hoped I would. However, I have written endless poems in my mind’s eye. Every time I step outside I marvel in the beautiful place in which I live. I have not given up hope for that precious writing time. After all, here I am on a snow day off of work – writing! Truthfully, our winter until the last few weeks has been relatively mild. Mid-January delivered some significant snow storms and freezing temperature. Like every year, in January it is light that I crave. This time of year I covet posts from my friends who live in southern locations and I peek at my photos of sunshine sifting through my summer blooms. Perhaps it is this hope that helps us go on with our days. I believe that metaphorically summer gives us something to look forward to and encourages us to toil and work hard. (Plus, I did notice this week when driving my step children to hockey practice that our days are getting longer. At 5:00 pm it was still considerably light out). The eternal optimist in my heart believes that we must make our own sunshine. Therefore, the spaces that I try to create in my life (whether it be my home, my classroom, or my blog) are filled with color. I think that is why I am so passionate about eating a variety of fruit and vegetables. I find myself in constant awe at the glorious colors and art in nature and food presentation. I had winter in mind when coming up with this recipe. 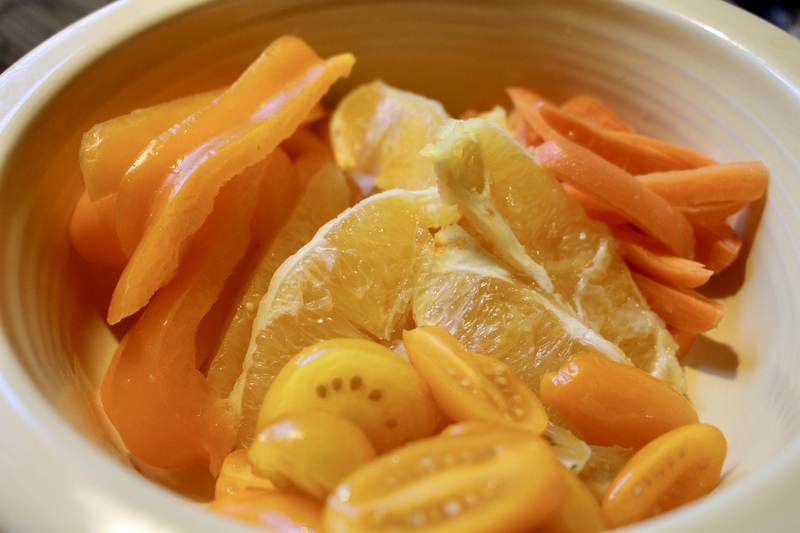 I intentionally wanted to create a bright bowl that utilized orange and yellow hued produce specifically for its health benefits. 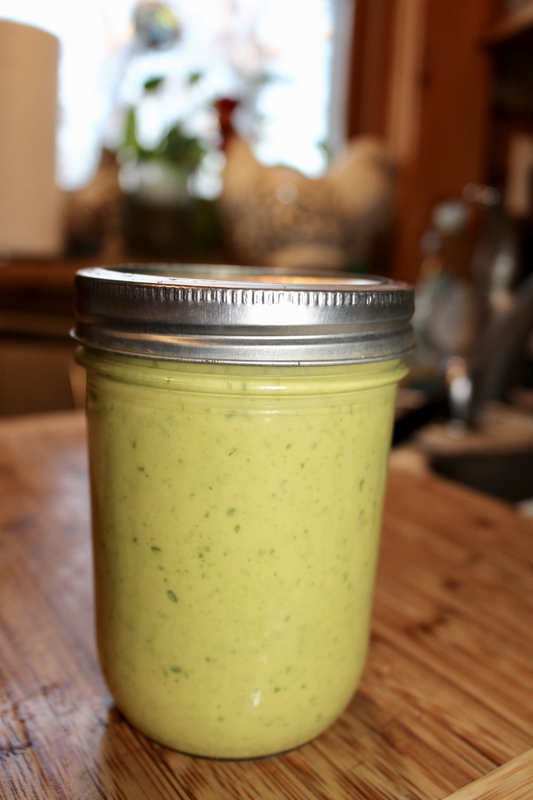 I also wanted to give the dressing a little heat, so I kicked it up with fresh jalapeno. These bright-colored fruits and vegetables contain zeaxanthin, flavonoids, lycopene, potassium, vitamin C and beta-carotene (Vitamin A). 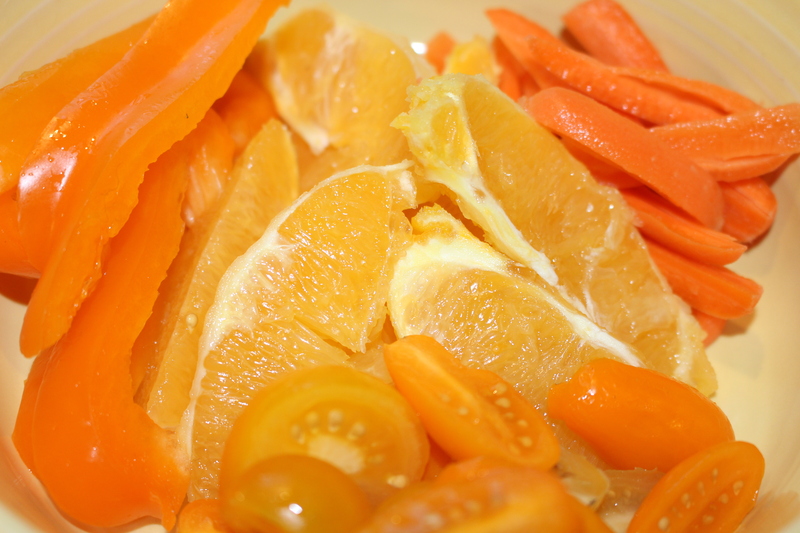 I have heard that nutrients found in yellow and orange produce have complexion promoting benefits. This time of year I find my skin really suffers from the effects of the dry air and lack of sunshine so it gives me another reason to eat my vegetables. In January, as I dream about sunshine, winter ices over precise words that I could use to describe a gold washed sky. So, I will let my Sunshine Bowls articulate. Blend well. I store the leftover dressing in a jar in the refrigerator and it keeps for over a month. In the past I’ve also used pineapple, butternut squash, and grapefruit. You can also toss in kale or spinach and some of your favorite beans, chicken, or nuts for protein. In celebration of the new year I cannot help but feel wonder for the opportunity that I have as a blogger to connect with people from all over and share my passion. I love healthy food, writing, photography, and brilliant color. Food should be savored and appreciated as a piece of art. The composition of flavor, color, nutrients, and attention to detail are vital to both pleasure and health. 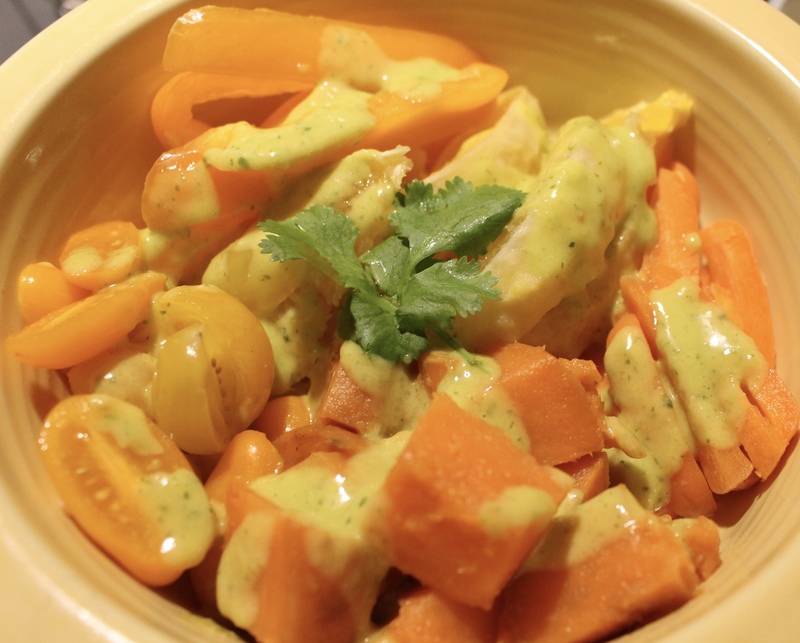 As always, if you try this recipe, I would love your feedback. Please feel free to share my recipes with others. Make sure that you check out my other healthy salads at the tab at the top of the page. Have a sunny day, My Friends! 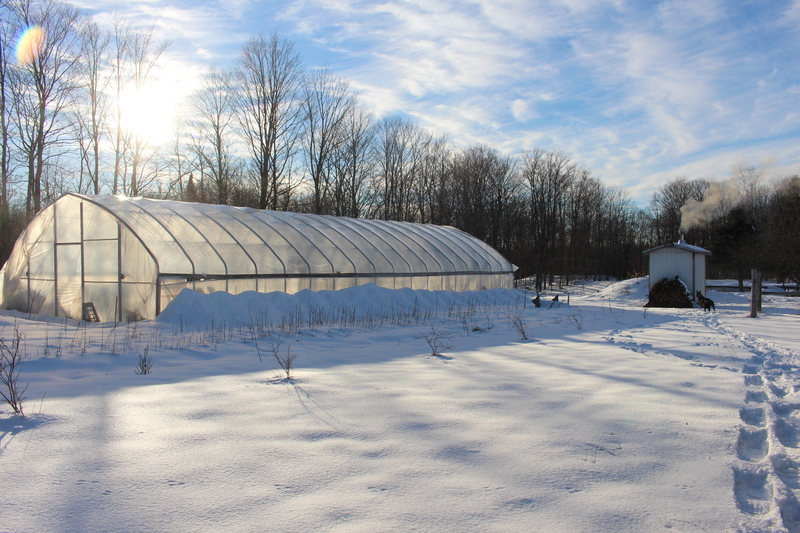 Even if in the winter it means having to manufacture your own sunshine. May your 2019 be filled with vibrant meals, health, and plenty of laughter. 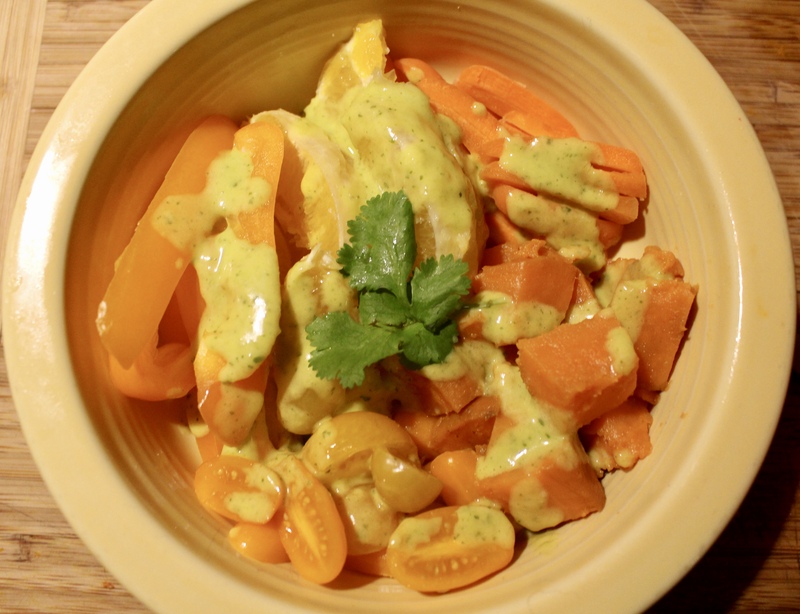 This entry was posted in Salad, Salad Dressing and tagged jalapeno, mango, Mango Salad Dressing, orange vegetables, salad bowl by Amy. Bookmark the permalink.